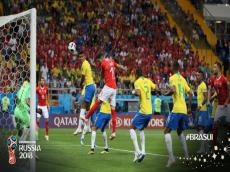 A second-half header from Steven Zuber cancelled out a sensational early goal from Philippe Coutinho as Switzerland and Brazil drew 1-1 in a tight Group E World Cup opener on Sunday, according to Reuters. With 20 minutes gone, Coutinho gathered a clearance 25 yards from goal and curled a marvellous shot into the far corner off the post to give the five-times world champions the lead. However, Switzerland, who had looked toothless throughout the first half, got back on level terms five minutes into the second period when Zuber rose unmarked to head home a corner kick. Coutinho had Brazil’s best chance after the break but shot wide. The result means that Serbia lead Group E after beating Costa Rica 1-0 earlier in the day.